It’s always a bit ot a problem with first issues. What do you say? Do you say hey wow. (ab and groovy, look at all the great things in this magazine, why buy any other (and so on)? Or do you go really quiet and sheepish and not say anything very much, hoping the magazine will speak tor itself. Hmm. I think we’ll go tor the first option myself. So. 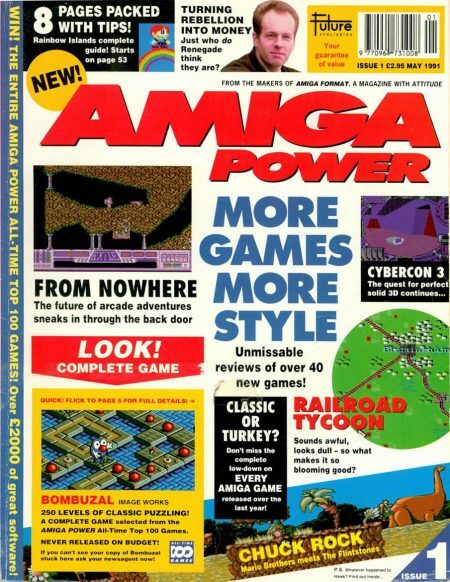 Amiga Power! It’s fab and groovy! It’s got full colour all the way through! It’s going to review every game that comes out – not just the best ones, or the ones that just happen to plop through our letter box each month! It’s going to be honest – there’ll be none of this every game gets 80%’ stuff! It’s not going to have anything irrelevant in it at all – no techie, widgety stuff, and certainly not a load of old rubbish about pop stars’ clothes comics whatever! Its going to carry a disk packed with hot demos and stuff’ on the front every month! It’s going to run compendious reviews of older software too, giving you a proper perspective on whole gaming scene’! It’s going to.. .but. ah. I give up. My heart just wasn’t into all that trumpet blowing, willy-waving stuff I’m afraid. No. I think you’re going to have to judge us by what we do and not by what we say. Which means it’s time I shut up right about now.